Last year, we wrote about Rep. Blake Farenthold introducing a small, but important piece of copyright legislation, the You Own Devices Act (YODA), which just says that if you buy some piece of computerized equipment, you can sell it with any included software, without having to get permission from the software provider. As we noted, the reality is that this is just making it clear that the first sale doctrine applies to computer equipment too -- which shouldn't need a new law, but some tech companies (especially in the networking space) feel otherwise. 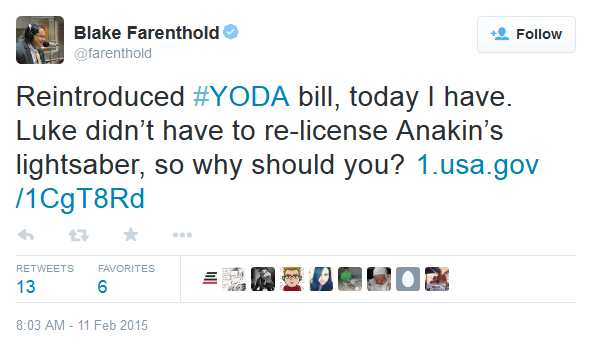 Farenthold has now reintroduced YODA, this time with Rep. Jared Polis as a sponsor as well (giving the bill that necessary "bi-partisan" shine). It's unfortunate that these kinds of bills are even necessary, but such is the state of copyright laws today, that they often mean the devices you buy, you don't even really own. Decades from now a wealthy man will have a surgically implanted device that cleans his bloodstream and supplies all the drugs, hormones and whatnot needed to greatly prolong his life. I would guess the period of time that such tech will be available only to the rich will be fairly brief. That tends to be the way of things, and such trends are generally accelerating.